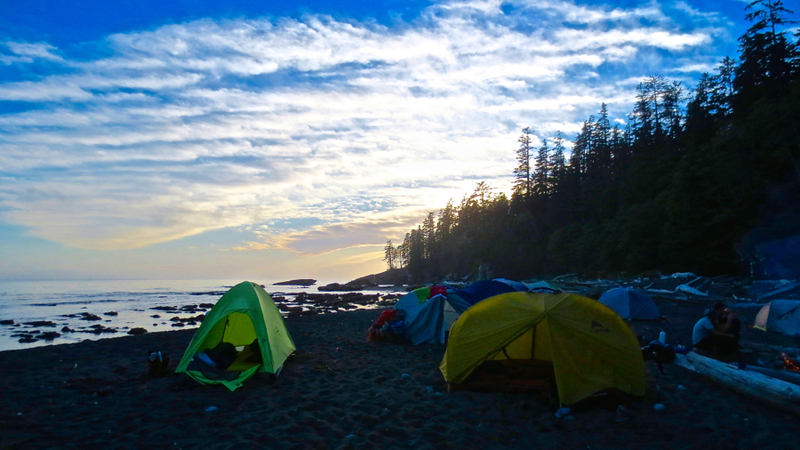 Toque & Canoe's Don Enright takes on Canada's legendary West Coast Trail. "You can scrape your knee anywhere. To do it here is a privilege." Where there is rainforest, there is rain. I don’t know why this never really hit me. I’ve been living along British Columbia’s Pacific shores for ages. But here I am on Vancouver Island’s West Coast Trail, surrounded by some of the world’s most beautiful temperate rainforest, and I am overwhelmed by the sheer liquidity of the adventure. Here, I’m referring to one of the region’s most vexing byproducts: mud. I’m hiking with Irie Adventure Tours, and owner Danny Page—over a beer in a local Bamfield pub the night before we set out— has done his best to prepare his small group of eight hikers, myself included. In addition to describing the rigours of the terrain, Danny talks about respect—for each other, for the watershed, for our First Nations hosts and for the landscape. The next morning, we attend the mandatory Parks Canada orientation, weigh our backpacks and enthusiastically set off into the rainforest. 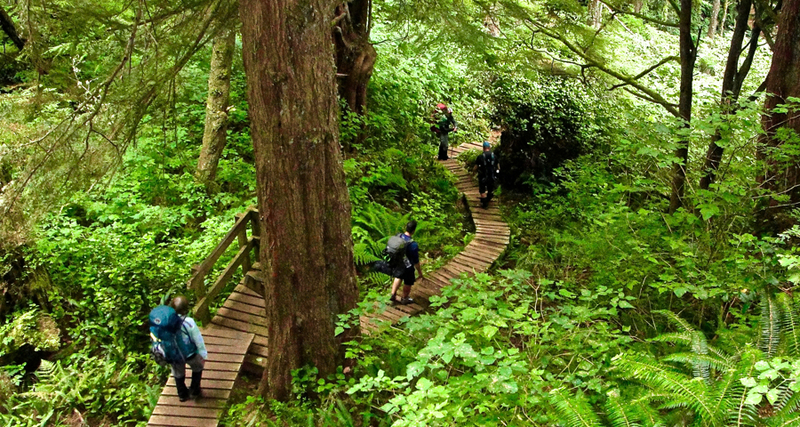 The West Coast Trail is a 75-kilometre trek through forest, rock and sand. And although it’s mid-July, it hasn’t dried out yet. In fact, at first the trail is one giant, endless wallow, and I fear for my feet, sodden from morning until night. I really should have spent more on boots. I also fear for the forest floor, as hikers tear an ever-widening track around the muckiest sections. I’m conscious of the impact we might have on this place, ancient home of the Huu-ay-aht, Pacheedaht and Ditidaht Nations. But as we soldier on, the rain yields to a misty coastal sunshine, and the muddy forest trail gives way to great long expanses of shoreline walking. I wasn’t expecting these magnificent beaches. In my view, they’re more beautiful than the beaches of Prince Edward Island, which says a lot, and they’re more wild than Vancouver Island’s legendary Long Beach. And, we have them to ourselves. The changing weather has brought in massive waves. They rise and loom and crest, then thunder inward toward us. At one point, I look out and imagine myself carving up the surf in a sleek black wetsuit, then I give my head a shake. Nope, not in this lifetime. My comfort zone is further inshore, and I take a moment to kneel at the edge of a tide pool. Sculpins dart among the limpets and hermit crabs—it’s a cauldron of creatures, all sheltering for a few hours before the great waves crash over them with fresh oxygen and nutrients. The naturalist in me registers seven different phyla in a pool one metre wide—vertebrates, crustaceans, echinoderms, mollusks, annelid worms and so on—before I scamper off to rejoin my friends disappearing in the distance. Everywhere on the trail are the sounds of animals, and, as I hike, I’m comforted by the creatures I hear but never see. Varied thrushes with their chill monotone whistle. Pacific wrens and their manic, breathless burbling. Swainson’s thrushes that wake us at 5 a.m. every day and lull us to sleep at 9 p.m. Along the seashore, tiny sandpipers wheel and circle; they’re already on their way back to South America after a brief visit to their Arctic breeding ground. Trackways of river otters line the shore. We never see them, but we don’t need to: the capering crisscross of their footsteps tells their story. And out in the water, we watch grey whales spout again and again in the same spot, tirelessly foraging. It never really occurred to me what hard work it must be, being a whale. As we hike, we discover a strange hikers’ schadenfreude among a few of the people we meet: some feel they’ve suffered, and they won’t be happy until we do, too. But we rise above this handful of naysayers. We meet hikers in their seventies who are having the time of their lives and their optimism buoys us. The hardships are a given; the goal isn’t to avoid them but to meet them head on. You can scrape your knee anywhere; to do it here is a privilege, a kind of rough sacrament. Sadly, two of our small group are evacuated at Carmanah Lighthouse—one with a torn knee, the other with blisters so nasty he can’t walk. It feels awful leaving them behind, though we know they’re in good hands. Am I hurting? A little. My feet are blistered but they carry me along. My knees are howling—as sensible 53-year-old knees should in terrain like this, but they hold up. My pack weighed 47 pounds at the start and I curse myself for not lightening my load. But I trudge on, and the trail gets easier over time. My own weakness is a fear of heights, and the ladders are terrifying. There are 51 of them in all: sick-making vertical reaches covered with mud and algae, exposed on open, dripping, windy cliffs. 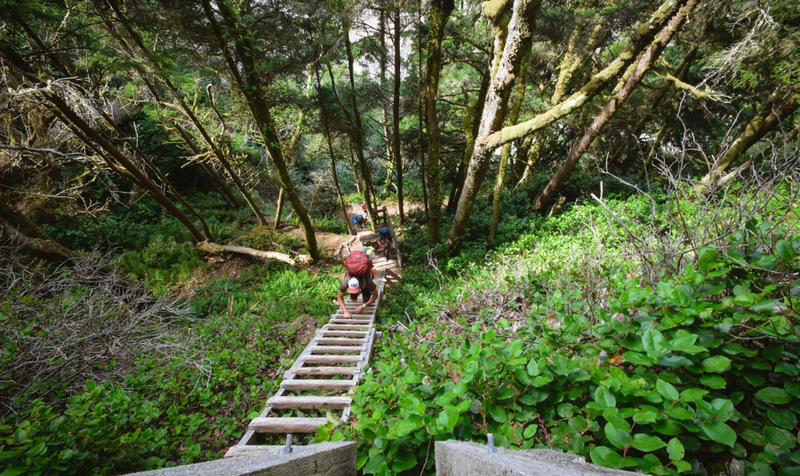 I get a little anxious at one point, halfway up the climb from a steep creek bed, and then I talk sense into myself: “Panic if you want, Don, but who’s going to save you up here? Might as well climb on.” I make it to the top where my friends take note of my trembling arms. 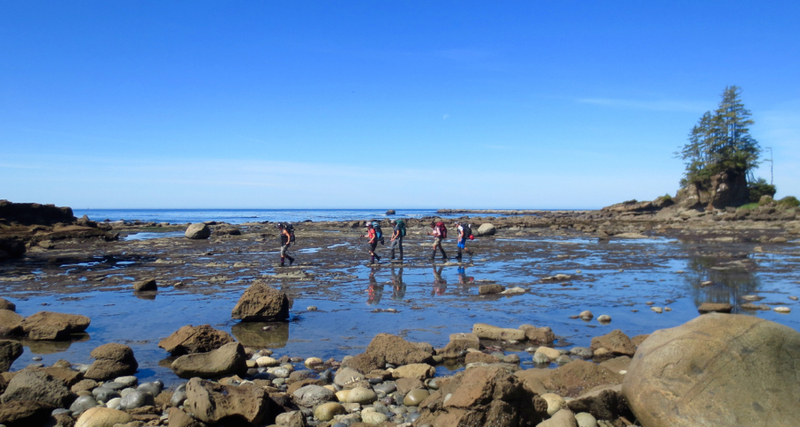 Later, we pause together at the rusted remains of a ship—one of many along this coastline—and I immediately think of the Valencia, the raison d’être of the West Coast Trail. The SS Valencia was a passenger steamship that hung up on the reefs off Cape Beale in 1906 while heading to Seattle in a storm. One hundred people perished as the ship broke apart in the waves. The lifesaving trail we’re walking on was cut into the forest after the tragedy. 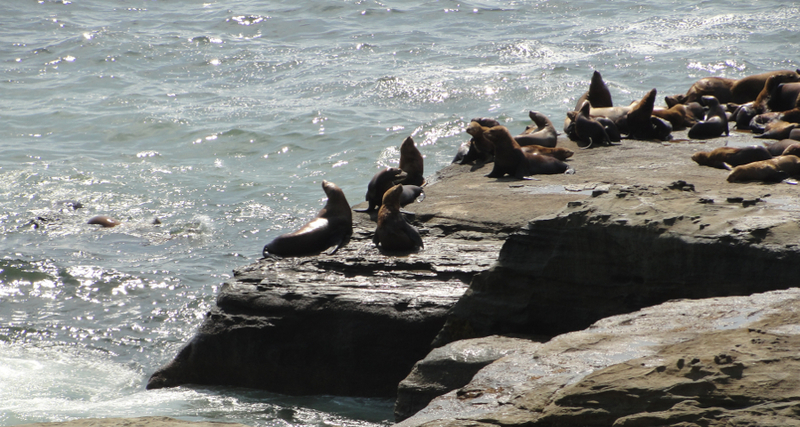 The lewd bawling of Steller sea lions echoes along the shore and cheers us. We climb into the forest and step back into our muddy rhythm. Occasionally, we meet people from local First Nations who are considered traditional guardians of the region. Carl Edgar Jr and his family operate Carl’s Crab Shack at Nitinat Narrows. It’s an incongruous but wonderful experience, to say the least, to wander out of the forest and find yourself suddenly able to buy beer, chips and seafood—the freshest crab, halibut and salmon money can buy. We linger next to Carl’s warm wood stove, but the call of the rainy trail eventually wins out, and off we go. At night, we savour the meals Talia, Danny’s wife, has prepared for us; she has a way with a food dryer, and her custom recipes are warm and delicious. We enjoy everything from sun-dried tomato penne to jambalaya to her amazing, and energy-sustaining, home-made power bars. After dinner, we coax saturated driftwood into flame and relive the day’s trek together. The group of us, perfect strangers until a few days before, now share utensils and confidences without hesitation. The humour and tenacity of my fellow hikers keeps me going. One night, I step away from the fire to stand at the ocean’s edge. Against the sky a group of cormorants weaves upwards to the setting sun. I gaze down the beach where campfires just like ours twinkle like distant fireflies. I pause to breathe in the dense Pacific air. In spite of the challenges, there is nowhere else on earth I need to be right now but here. I linger a few more minutes before crawling into my tent for the night; it’s not yet 9 p.m.
We wake early the next day and break camp. Onward into the West Coast sunshine we walk. We have promises to keep, and kilometres to go before we sleep. Don captured the wonder of the trail perfectly. And the trail is hard to describe in words, it really must be experienced.